These terms are the basis on which inniAccounts shall provide accountancy services to you in order to help avoid any misunderstanding of our respective responsibilities and our services. These terms apply in respect of the provisions of our services and all work carried out by us will be governed by them. From time to time we may update these terms and you agree to review these terms regularly. Continued use of our services will mean that you agree to any changes. You will be notified of any significant changes to our terms of service. Our monthly subscriptions include payroll for up to 2 directors / employees. For 3 or more directors / employees our extended payroll service is required. Handle day to day correspondence from HMRC on your behalf – this includes writing and speaking with HMRC where required. Non financial reference letters based on our standard format letter. Our service to you includes unlimited advice on day to day tax and accounting related topics and support with our Online Application. The unlimited advice however is subject to a fair use policy. If we determine that the amount of advice has or will exceed fair use we may charge separately for ongoing advice to you. On occasions where specialist advice needs to be sought it maybe necessary for us to contact carefully selected third parties for guidance. Additional fees may apply this specialist advice that we will notify you of in advance. As accountants we are not regulated by the Financial Services Authority to conduct financial reviews, or offer investment or tax planning advice. For such advice we recommend you seek advice from a regulated and authorised Independent Financial Advisor. Your records in our Online Application are entirely your responsibility and we are wholly dependent on them to provide our service to you. It is your responsibility to ensure their completeness and accuracy and that they will not be misleading or fraudulent. So that we can prepare accounts and tax returns and so our Online Application can provide you with up to date financial information about your company, you agree to regularly keep all your records up to date in our Online Application. You agree to ensure your bookkeeping records in our Online Application match all your business bank accounts exactly when you reach your VAT period end, company financial year end, and before you process dividend payments. Any missing or inaccurate entries may result in your taxes being calculated incorrectly for which we cannot be held responsible for. If you fall behind on your record keeping or if incorrect returns are submitted as a result of errors or omissions, additional fees may apply to reconcile your accounts. You agree that you will enter your complete accounting records into our Online Application. Supplementary records external to the Online Application will result in additional fees unless you agree with us in advance the supply of separate records. You agree to review and approve your VAT returns in the Online Application before we submit your returns to HMRC on your behalf. You agree to notify us if you believe your circumstances have or will change such that it affects your eligibility to use the Flat Rate Scheme or any other aspects of your VAT accounting. You agree to review your company payslips to ensure accuracy prior to submission via RTI. To comply with HMRC RTI requirements, corrections cannot be made to payslips in our Online Application once submitted to HMRC. You agree that you will process payslips and dividends in our Online Application before any payments are made. We will have no access to your bank accounts. You shall ensure that payment of all taxes are made to HMRC in time and for the full amount as per our guidance. It is the responsibility of the company director or secretary to ensure that a confirmation statement (CS01) is filed at Companies House each year. You agree that you will ensure this requirement is met each year. Should you subscribe to our Company Secretarial Service, we will take of this responsibility. To avoid penalties and interest charges it is important your records at HMRC and Companies House are always up to date. You will notify us of any changes to your personal details including names or addresses. You are legally responsible for making correct returns for your tax liabilities and for making payment of the taxes on time. So that we can provide services to you to help you continue to be compliant, you agree that any information we request will be provided by you in a timely manner. Failure to meet deadlines and resultant penalties due to late supply or delays in the provision of information requested will be your responsibility. Should you make any changes to your company structure, for example appoint shareholders or directors, you agree that you will notify us. We will ensure your records are up to date to ensure on-going compliance. Any correspondence you receive from HMRC or Companies House, no matter how insignificant, maybe important to us in the performance of our duties. You agree to promptly forward any correspondence to us. The transfer of a trading company to our Online Application will be complete once we have inputted your opening balances from previous years accounts and / or in year balances. This is dependent on the provision of complete records from you and / or your previous accountant. If you previously appointed an accountant to look after your accounting requirements, we will contact them to gain Professional Clearance and to transfer your accounting records. Accounts production and tax returns for previous company financial year(s) are not included within our monthly subscription fee. We can assist with manual accounts production separately if required. Should any issues be identified in previous accounts or tax returns they shall be brought to your attention. We shall await your instruction before proceeding. If you appoint us part way through your company year, a migration fee will apply that we displayed in our application form when you appoint us. We will commence acting as your accountant from the date that you appoint us subject to professional clearance and receipt of your accounting records. Any issues that subsequently arise that relate to errors in submissions or records predating our services to you, additional fees may apply. Using the records provided by your previous accountant, we will input your company opening balances in our Online Application. We cannot be held responsible for any inaccuracies, omissions or errors within the opening balances. If your opening balances have not been entered by the end of your company financial year that we are appointed, we will be unable to prepare your year end accounts. We will if requested by you, prepare and file Self Assessment Tax Returns for directors and shareholders of your company. Depending on your subscription, a fee maybe charged. Fees are calculated and displayed before you submit the Self Assessment Tax Return questionnaire in our Online Application and depending on your subscription, may vary depending on the complexity of the return and the date the questionnaire and supporting information is submitted. We will quote you for preparation of returns based on the information you enter in our Self Assessment Tax Return questionnaire. Should upon receipt of additional information to allow us to prepare the return we find that significant additional work is required to complete the return, we may need to quote an additional fee. On all subscriptions, questionnaires and supporting information submitted after 31 October will be subject to an additional fee. To guarantee meeting the HMRC filing deadline 31 January, your questionnaire must be submitted and supporting information provided before 31st December. You agree to provide all the information related to personal income for the given tax year before we start to prepare tax returns. If a tax return shows that HMRC are due additional tax, we will explain how much needs to be paid to HMRC. It is the tax payers responsibility to make the payment on time from their personal bank account. The individual whose return is prepared will be required to check their own return prior to its submissions to HMRC. If a return is prepared and approved by the individual then later found to contain errors, a repeat preparation and filing charge will be made to correct the error. If any errors result in additional payments being due to HMRC, inni Accounts cannot be held responsible and it is the tax payers responsibility to make the payment to HMRC. We will deal with all communications relating to returns addressed to us by HMRC or passed to us by you. However, if HMRC chooses your return for a random enquiry this work may need to be the subject of a separate assignment in which case we will seek further instruction from you. Manage any changes to your statutory company records including updates to officers of the company and shareholdings. The registered office service does not include appointing us as your Company Secretary or mail forwarding. Only official correspondence from Companies House and HMRC maybe sent to our address. All other correspondence must be sent to your trading address. Your company trading address shall be recorded as the place you specify to us from which you conduct your business from. This cannot not be our address. If you subscribe to our bank feed service we will import your bank transactions into our Online Application. As the data is provided to us by your bank, we cannot guarantee the accuracy or availability of data we receive. You must therefore ensure that you periodically check to ensure your records are accurate and complete. An optional feature of the Online Application is a statement importer. This allows, subject to your bank being supported, the import of electronic bank statements containing your business bank transactions. When using this feature you shall be responsible for ensuring completeness and accuracy of the imported records. You should therefore check after each import that your transactions and rolling balances match your business bank statements. We may offer you a bookkeeping service. Using your business bank statements or bank feeds we shall reconcile your business accounts in the Online Application. Due to the limited information about your transactions included on bank statements and in the absence of original receipts or invoices, you will be required to check transactions recorded for accuracy of accounting categories and VAT rates. inni Accounts shall not be held responsible for any errors or omissions. Your review and approval will be required prior to submission of any tax returns or company accounts. This section only applies if your company is required to, or if you elect to voluntarily operate an employer workplace pension scheme. inniAccounts currently is only able to support workplace pensions when payroll is operated monthly. Pensions are a regulated activity and as accountants we are not permitted to provide advice. Specifically, we cannot advise on the suitability of pensions or investments for individuals. Individual’s must seek advice from an Independent Financial Advisor. As your accountant we are able to provide guidance with workplace pensions. We can for example, help identify available workplace pension schemes for your business. This advice however, cannot extend to you personally as a potential individual member of a workplace pension or any other pension scheme. Such advice must be sought from a suitably qualified Independent Financial Advisor. As well as selecting an eligible scheme, you are responsible for regularly reviewing its suitability. You will need to open your chosen pension scheme and accept the providers terms and conditions. Where applicable, you will also need to pay any set up fees chargeable by your provider. Depending on your chosen provider, inniAccounts may be able to provide assistance opening the scheme. You must authorise inniAccounts to act on your behalf at your chosen pension provider. You must grant access and permission to allow us to configure your scheme and submit records each payroll period. 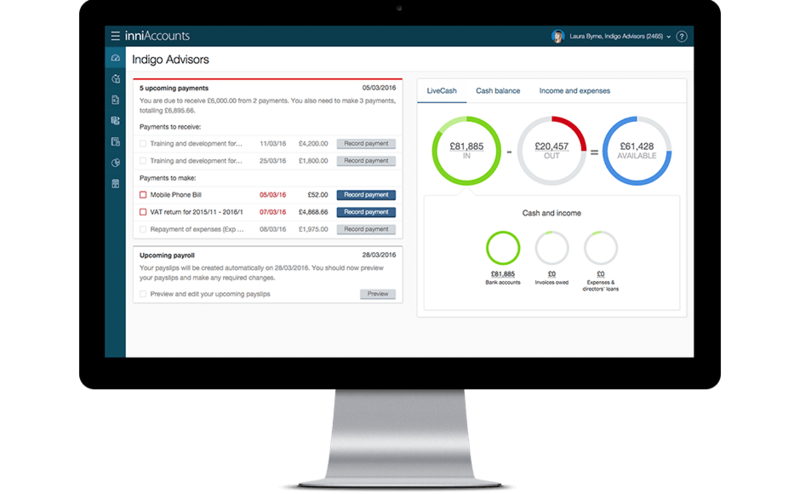 inniAccounts will configure your workplace pension scheme with your chosen pension provider to ensure alignment with details held within inniAccounts software for your company. at your staging date – We will establish the staging date applicable for your payroll. You will need to advise us if you bring forward, postpone or otherwise delay any aspect of your staging. We will assist you in establishing when the staging date must be applied – this is the date that you as an employer must start to automatically enrol your employees whom are classed as eligible jobholders. Using data supplied by you to prepare your payroll, we will help you identify those individuals who would qualify as ‘eligible jobholders’ for automatic enrolment purposes. at the point of automatic re-enrolment (3 years after your staging date) – You will need to re-enrol all eligible jobholders every three years. We will assist you by helping you identify and communicate with your employees. at your employee’s assessment date when applicable – You are responsible for monitoring your employees age and earnings and agree to advise us on any change in the categorisation or status of your employees. We will provide you assistance with this. You are responsible for ensuring your employees are briefed and have access to information about their status be that automatic enrolment, right to opt in or right to join. This includes providing information about your (as their employer) and their minimum contribution levels. You are responsible for deciding your employer contributions to your employee pension schemes. You must inform us of any changes to these contributions. You will inform us of any material changes in circumstances that could affect the pension scheme, employees or deductions. If you are unsure whether the change is material or not, please let us know so we can assess the significance. You are responsible for monitoring opt-in and opt-out requests made by your employees, and their requests to increase or decrease their contribution levels. We will assist you where we can with monitoring and will supply information to you to assist your employees. If your employees require assistance with their pension or have questions, they must discuss them with your chosen pension provider or with you as their employer. inniAccounts is unable to provide support directly to your employees. We will help ensure that any set contribution levels meet with the minimum contribution levels prescribed by the Pension Regulator. If you are exempt of duties (voluntarily elect to operate a scheme), minimum contribution levels do not apply. We will submit records detailing your employee and employer contributions to your chosen pension provider each payroll period. This will be done either using your pension providers website or via their API. We or your chosen pension provider will prepare and send to you, for distribution, a notice for each eligible jobholder telling them that they have been or will be enrolled. This notice will set out what that means for them and detail their right to opt out and in. We or your chosen pension provider will produce, gather and provide any required statutory communications for you. You must ensure that all statutory communications are distributed to the relevant employees. You will be responsible for setting up a direct debit with your chosen pension provider for all payments you need to make to them. We shall prepare and submit your Declaration of Compliance to The Pensions Regulator on your behalf. You will periodically check your records in our software to ensure they are up to date. This includes reviewing deductions on employee payslips each payroll period before submissions are made to HMRC via RTI and your pension provider. Should you identify an error or omission on a payslip after your records have been submitted to HMRC and your pension provider, it will normally be resolved in your next payroll period. In some circumstances where it is possible and necessary to correct an error immediately, we may need to charge an additional fee to resolve and resubmit your records. All fees and charges made by your pension provider are now, and in the future, your responsibility. inniAccounts charge a one off set up fee when you open a new workplace pension scheme. This fee includes the preparation of your workplace pension scheme with your chosen provider and in our online accounting software. We will not accept responsibility if you act on advice previously given by us or anyone else without first confirming that the advice is still valid in light of any change in the law or your circumstances. Our services, as detailed in this document, are subject to the limitations of liability set out in our engagement letter and in the ‘Limitation of Liability’ section of our standard terms and conditions of Business. All fees are payable in advance and by Direct Debit. Year end accounts preparation requires continuous fees to be paid throughout your company financial year up to your year end. Our services rely on continuous payment of monthly fees and we are unable to provide breaks in monthly subscription payments unless your subscription allows Trading Breaks. For our continued service including the filing of your returns with HMRC, all payments must be up to date. Any additional work due to your account with us being placed on hold or canceled may incur additional charges. Your monthly subscription may include Self Assessment Tax Return(s) and/or P11D(s). In order to qualify for these returns you must have been subscribed and be paying monthly fees on the 5th April during the tax year in which the return relates. Previous years tax returns are not included in any subscriptions however we can provide you with a quote if required. Fees for services not included in the monthly fee will be collected by direct debit. In some cases however, we may required upfront payment before work commences. Migration between monthly subscriptions may only be allowed at the discretion of Inni Accounts Ltd. This subscription includes our accountancy service, one basic Self Assessment Tax Return, one P11D and the Company Secretarial Service. Normal terms apply to each individual aspect of these services. Should your Self Assessment Tax Return be more complicated than a basic return, i.e. when income is not solely from salary and dividends, an additional fee will apply due to the extra time required to complete the return. Any additional fees will be displayed when you complete your Self Assessment Tax Return questionnaire in the Online Application. If you require additional Self Assessment Tax Returns or P11D’s for other members of your company, we can assist and normal fees apply. These subscriptions include our accountancy service, two Self Assessment Tax Returns, two P11Ds and the Company Secretarial Service. The Managed subscription also includes our bookkeeping service. Normal terms apply to each individual aspect of these services. We will complete up to two Self Assessment Tax Returns at no additional cost. The completion of returns are subject to a fair use policy such that in the unlikely event that a return requires extensive time to complete, e.g. large volumes of or complex transactions, or it requires specialist advice, an additional fee may apply. Should you wish to downgrade your subscription from Pro-active or Managed, we require you to have made 6 months fee payments of your current subscription before downgrading. you are not within 6 months of your company year end. If you qualify, you will receive our normal services however your monthly fees will not start until your trading start date or 6 months from your company year end date, which ever is sooner. To qualify for your payments to be placed on hold, you must also complete our application form, appoint inniAccounts as your accountants and set up a Direct Debit in our Online Application. receiving money into your business either as cash or into your accounting records. This could be a payment for work or a sale, advanced payment for work, loans to your company etc. The subscriptions to services that allow first payment to be placed on hold also include Self Assessment Tax Returns and P11Ds. We shall complete these for you if your monthly payments start before 5 April of the tax year which the returns relate. If we are appointed before 5 April and your monthly payments to us do not start until after 5 April, separate fees will apply for these returns that we will quote you for. Whilst payment are on hold, should you require any other service that is not included in our monthly fee we will provide you with a quote. Any referral discounts will be applied and start from the date the code is provided to us, even if payments are on hold. This means that the discount may be applied during the period payments are on hold. Should you have a pause in trading activity you may qualify for a trading break of up to 3 months. During this time, our services will continue on the reduced down package called a Trading break for up to 3 months. Any services not included in your monthly subscription are still charged separately. your business is not receiving payments from anyone (except payment of invoices for work completed before your company stopped trading for this short period), income from passive sales such as software sales, stage payments or any other form of income. A Trading break must be requested in writing and if agreed, will start from your next billing date which is the date we send you your invoice each month. We are unable to pro-rata for the period you are in when you request the Trading break and we cannot give refunds for previous billing periods where you have not traded. You must contact us when you know the date you will recommence trading activities and your payments will restart on your billing date following the date you recommence trading. If you have not contacted us within 3 months of the start of your Trading break, your monthly fees will restart automatically. You will be given a referral code that you can share with your friends and colleagues. This code will entitle you and your colleagues a discount off your monthly accountancy subscription fee. In order to qualify for any discount you must pass your code directly to your colleague. Should you wish to promote or published your referral code online, you must seek our consent in advance. We do not accept referral codes published online without our permission. Referral codes will be applied from the date we are provided the code. They cannot be pre or post dated. For your security we operate a single, nominated point of contact for your company. This is likely to be you however you may nominate another person within your business. All matters relating to your company or any individual within it will be communicated to by inni Accounts directly through the nominated point of contact. We have a duty under section 330 of the Proceeds of Crime Act 2002 to report to the Serious Organised Crime Agency (SOCA) if we know, or have reasonable cause to suspect, that you, or anyone connected with your business, are or have been involved in money laundering. Failure on our part to make a report where we have knowledge or reasonable grounds for suspicion would constitute a criminal offence. We are obliged by law to report to SOCA without your knowledge and consent and in fact we would commit the criminal offence of tipping off under section 333 of the Proceeds of Crime Act were we to inform you of any suspicions or that a report had been made. We are not required to undertake work for the sole purpose of identifying suspicions of money laundering. As with other professional services firms we must identify our clients for the purposes of the UK anti-money laundering legislation. As such we are required to carry out identity verification checks before we can provide services to you. We may request from you, and retain, such information and documentation as we require for these purposes and/or make searches of appropriate databases. In addition we may also carry out identify verification checks that will be logged on your credit file however it will not affect your credit rating in any way. Should any of your contracts be classed as being within IR35, HMRC expect that income received should be based on a deemed salary (i.e. no dividends) on which tax and national insurance will be due. It is your responsibility to take appropriate measures to ensure that you understand the legislation and seek legal advice if unsure of your contract status. We shall assume that your contracts are not within (outside) IR35 unless you notify us in advance. Should any of your contracts be within IR35, a deemed salary calculation will be required each year. Our service excludes support for work undertaken under HMRC’s Construction Industry Scheme (CIS). It is your responsibility to understand the legislation and determine the applicability of CIS to your circumstances. Should your work be subject to CIS our service to you will be terminated. We will support transferring your information to an appropriate accountant, or assist in closing your company (subject to our normal fees). No fees will be refunded upon termination. In some circumstances, commissions or other benefits may become payable to us in respect of transactions which we arrange for you, in which case you will be notified in writing of the amount, the terms of payment and receipt of any such commissions or benefits. The fees that would otherwise be payable by you as described will not take into account the benefit to us of such amounts. You consent to such commission or other benefits being retained by us without our being liable to account to you for any such amounts. We are not regulated by the Financial Conduct Authority to provide investment advice. Should you require investment or pension planning advice you should contact an Independent Financial Advisor. We will provide reasonable assistance where required following your agreement by providing to your advisor information they request. We do not provide advice on the selection of banks or accounts to apply for. We may identify features of some banks to you that we consider may benefit you when using our software or services. This will not be a recommendation on a bank for your personal or business circumstances. We have relationships with a number or firms and with your permission, we may introduce you and share information with third party service providers which in some cases we may receive payments which will be disclosed to you by them. You agree to all payments being retained by inniAccounts. We make no guarantees about the service provided by any third party we recommend or highlight to you. We will open all mail we receive at our address related to you, your company or anyone involved in your company. Only official correspondence from Companies House and HMRC should be received at our address. All mail related to your business activities must be addressed to your company trading address. We will, to the best of our ability, provide to your company accurate and timely forecasts of PAYE, VAT and Corporation Tax liabilities, based on information you have provided to us (see “Your Responsibilities”). Should you have reason to believe these forecasts are incorrect you should notify us in writing within 30 days. We cannot be held responsible for liabilities incurred before our appointment date. Benefits in kind, and subsequent liabilities are excluded from this guarantee. Claims are subject to our Limitation of Liability. We always aim to provide the highest levels of service possible, however, should you have a concern you should contact your account manager in the first instance. We undertake to look into any complaint carefully and promptly and do all we can to explain the position to you. We will do everything reasonable to put matters right. Should you feel that you need to escalate your complaint, please contact Jess Austin (jess@inniaccounts.co.uk). You can cease our services at any time by giving 30 days notice in writing to support@inniaccounts.co.uk. Notice of termination must be given in writing. Should you cancel your subscription without having made 3 months payments of your subscribed service, to cover our initial costs a £147+VAT fee will become due. Upon cancelling our appointment we shall calculate the balance of any fees due to us for the remaining term that must be paid in full within 30 days. No refunds will be given for subscription fees already paid. It is your responsibility to export all your records from our Online Application. You will continue to be able to access your account for 30 days after you give notice to allow you to download your records. After this period your account will be closed and data archived or deleted. After an account is archived, access to our Online Application cannot be reinstated to you. If available, recovery and supply of archived records will be subject to a fee, payable in advance. We are under no obligation to continue providing services to you if our fees are not paid on time. Whilst any amounts are overdue we reserve the right to suspend all our services to you including revoking access to our Online Application and cessation of accounting services. Should we suspend your account for any reason, a reactivation charge will apply, payable in advance. We reserve the right to charge interest on overdue accounts at BoE base rate plus 5% and we also reserve the right to cease services for any reason by giving one months notice. If we terminate our services then no refunds will be given and we will not be held liable for any penalties or interest from HMRC, Companies House or any other parties. Where services are suspended, no liability is accepted by us for consequential losses, late filing penalties, interest or other charges. Should you fail to adhere to these terms of service or if we are unable to contact you, we reserve the right to terminate our services to you. We will write to you at your last known address to confirm cessation of services. Insofar as we are permitted to so by law, we reserve the right to exercise a lien over all funds, documents and records in our possession relating to all engagements for you until all outstanding fees are paid in full. We will frequently communicate with you using email or by other electronic means. On rare occasions this may result in delayed or non-receipted communication or mis-direction that we cannot be held responsible for. Internet email is not a 100% secure communications medium. We advise that you understand and observe this lack of security when communicating with us. Although we believe our emails and any attachments are free from any virus or other defect which might affect any system into which they are opened or received, it is your responsibility to check that they are virus free and that they will in no way affect systems and data. No responsibility is accepted by us for any loss or damage arising in any way from receipt, opening or use of electronic communications. Calls may be monitored for training and quality purposes. We will make every reasonable effort to ensure that our service to you and Online Application is available. We cannot however guarantee that it will be timely, without error, 100% secure, or available at all times. This is because we are reliant on the internet to deliver our services. Any actions necessary to continue to provide high quality services may result in brief periods of down time to carry out maintenance activities. We will work hard to ensure that any disruptions are kept to a minimum. We do not make any guarantees that there will be no loss of data and we cannot accept any liability for any loss of data no matter how caused. During our services to you we will collect and store records. Any original records will be retained for a maximum period of 6 years after which they will be destroyed. Where you are in possession of original records, you must retain them for the same period. Unless you provide us with written instructions to retain your records for a longer period, we will destroy your records after 6 years. We may convert original documents into an electronic format for retention. In such cases we may destroy the original documents that we hold earlier than 6 years. These Terms of Service shall be governed by, and construed in accordance with, English law. The Courts of England shall have exclusive jurisdiction in relation to any claim, dispute or difference concerning our terms and conditions and any matter arising from them. Each party irrevocably waives any right it may have to object to an action being brought in those Courts, to claim that the action has been brought in an inconvenient forum, or to claim that those Courts do not have jurisdiction. To enable us to discharge the services agreed under this engagement, and for other related purposes including updating and enhancing client records, analysis for management purposes and statutory returns, crime prevention and legal and regulatory compliance, we may obtain, use, process and disclose personal data about you and other members of your company. You have a right of access, under data protection legislation, to the personal data that we hold about you. We confirm when processing data on your behalf we will comply with the provisions of the Data Protection Act 1998. For the purposes of the Data Protection Act 1998, the Data Controller in relation to personal data supplied about you is inniAccounts Ltd, 1 Derwent Business Centre, Clarke Street, Derby DE1 2BU. As an employer, should you employ any persons or have additional directors or shareholders, to be compliant with the Data Protection Act you must ensure that members of your company are made aware that address data will be provided to HMRC during the lifetime of their engagement. It is sufficient for you to make members of your company aware through general communications. The advice that we give to you is for your sole use and does not constitute advice to any third party to whom you may communicate it. We will provide the professional services outlined in these terms with reasonable care and skill. However, we will not be responsible for any losses, penalties, surcharges, interest or additional tax liabilities arising from the supply by you or others of incorrect or incomplete information, or from the failure by you or others to supply any appropriate information or your failure to act on our advice or respond promptly to communications from us or the tax authorities. To the maximum extent permitted by law, we exclude all liability and responsibility to you whether arising from negligence, breach of contract or otherwise for any incidental, special, indirect, exemplary, consequential or any other damages relating to the use of or inability to use our Online Application or website. The opinion we provide may vary from other opinions based upon the same information. Our assessment and opinion therefore is not subject to any guarantee, warranty or indemnity that the risk assessed by us will not be challenged by HMRC or, any subsequent tribunal that may find your status is different from that assessed by us. You also agree that our assessment is only a guide based on current regulations and that the ultimate responsibility for the tax liabilities, interest and penalties and any other consequential costs remains yours. Our total liability for any loss or damage relating to your use of or inability to use our Online Application shall not exceed an amount equal to the monthly fees that you paid to us in the previous month. Accounting calculations found to be incorrect due to issues within our Online Application or as a result of error by us will be rectified as soon as possible. We cannot be held responsible for any consequences or losses caused by such errors. You agree to hold harmless and indemnify us against any misrepresentation (intentional or unintentional) supplied to us orally or in writing in connection with this Agreement. You have agreed that you will not bring any claim in connection with services provided to you by the firm against any of our directors or staff on a personal basis. Once agreed, these terms will remain effective until they are replaced. Either party may vary or terminate our authority to act on your behalf at any time without penalty.